9691-9699 14 Gage Stainless Steel Floor, Area & Indirect Waste Drains with 12"(304) Square Top - Jay R. Smith MFG Co.
Used in nuclear and fossil fuel power stations, chemical plants, laboratories and other areas where the corrosion resistance of type 304 stainless steel is satisfactory for the intended service. Also used in other locations such as breweries, dairies, creameries and similar processing plants where superior corrosion resistance, durability and longevity are required. 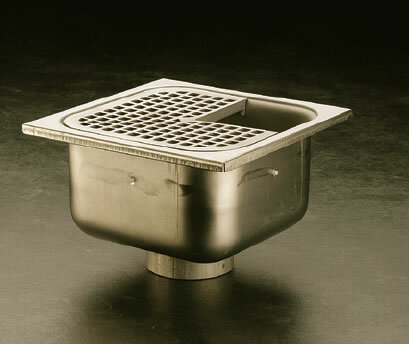 Excellent for use in restaurants, schools and all types of food handling areas for ultimate sanitation. 14 Gage Type 304 SS Receptor Body with " Seepage Control Holes", Cast Type 316 SS Ribbed Non-Tilt Loose Set Grate with 1/2"(13) Square Holes. 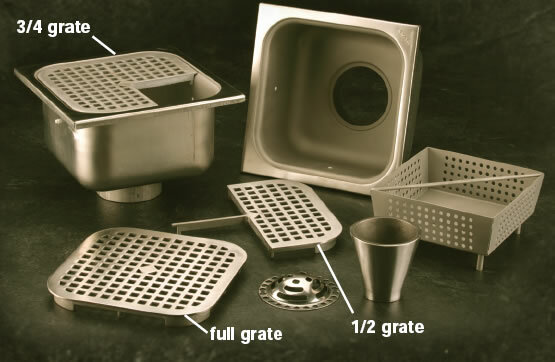 Perforated SS Dome Bottom Strainer or Sediment Bucket as Indicated by Figure Number.